It’s another rainy day in the garden. Rather than dodge raindrops with the camera, I thought I’d take you on a tour with some photos I snapped during the sunnier days last week. First though, can we pause a moment to celebrate the Outlaw Garden’s birthday? Yep. 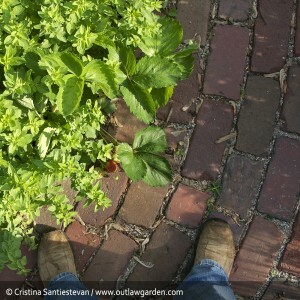 The garden is one year old! Or, well, it’s approximately one year old. 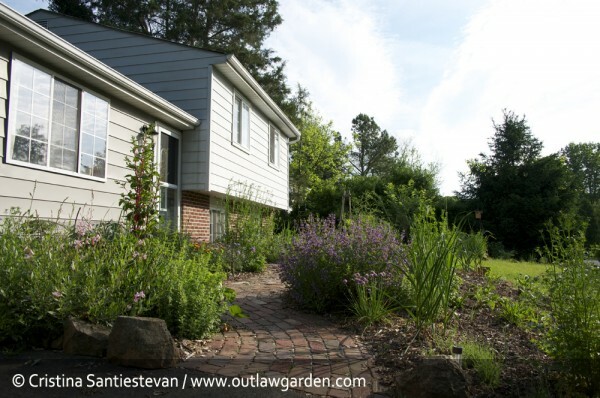 I figure the Outlaw Garden was born last May, when I planted the first six blueberry bushes and began to rip out the front path. It was messy, demanding and exhausting. Which, really, is a lot like a newborn. 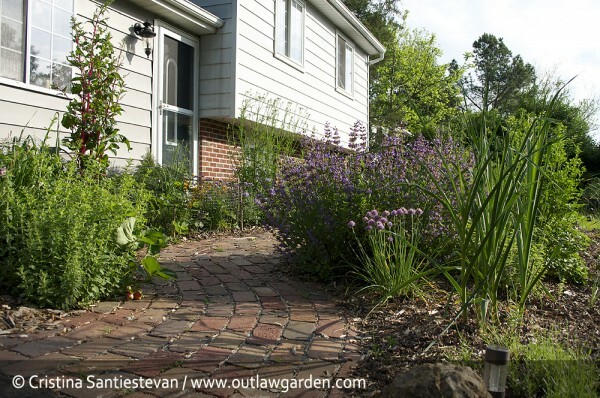 So, May is when we celebrate the Outlaw Garden’s birthday. Nice, huh? 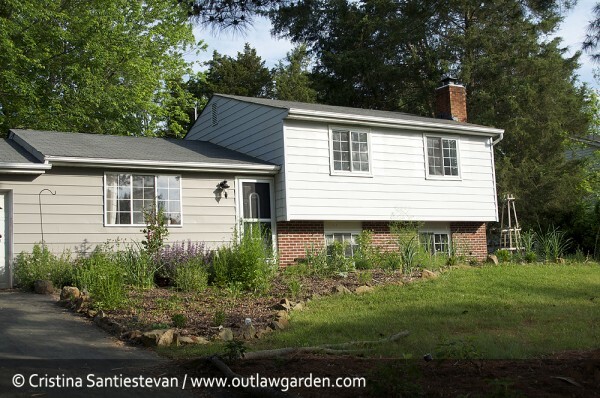 In the days before taking this photo, I ripped out the old front path, removed a chunk of the driveway that bulged into the flower beds (did someone spill asphalt there years ago?) and dug out a lot of dirt to create a flat-ish base for the new brick path. May 2011. 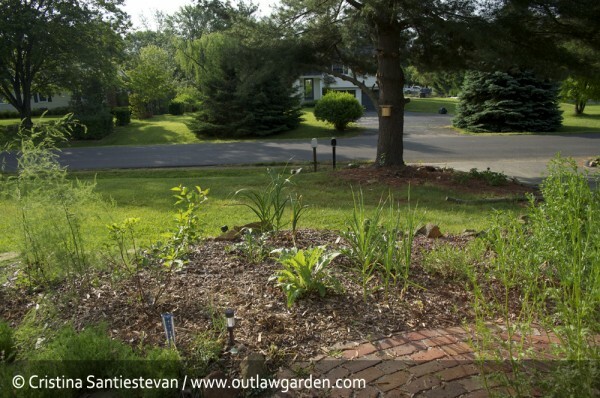 That’s when the Outlaw Garden was born. 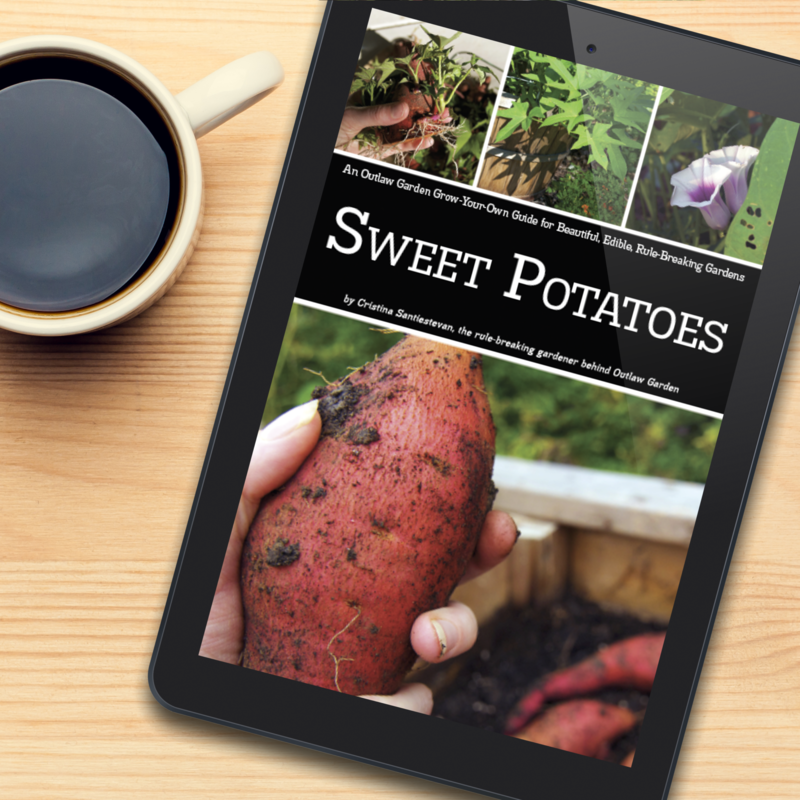 We’re celebrating a year of rule-breaking, HOA-snubbing, front yard vegetable gardening this month. I know. I’m exhausted all over again, just looking at the difference between those photos. It’s been a BUSY year in the garden. Since May 2011, I’ve planted seven blueberry bushes (and mourned the loss of one), one dwarf Santa Rosa plum tree that shows no evidence of dwarfism, five or six artichokes, a small clump of asparagus and countless strawberries. 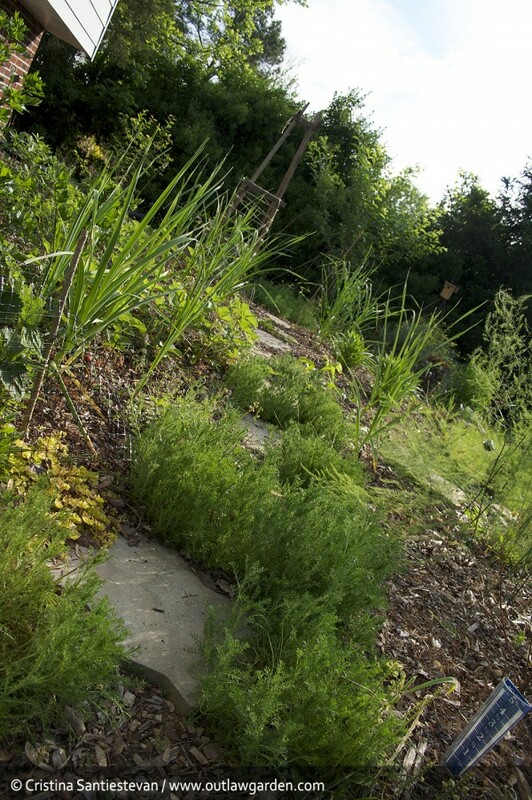 Also a hill of herbs — rosemary, two sages, oregano, chives — and loads of tomatoes, peppers, squashes and more. The 2011 gardening season was intense. Wonderful. Exhausting. And, a hell of a lot of fun. But, we’re supposed to be touring the garden. To the left (on the house-side of the path), I’ve got two ‘Northland Blue’ blueberry bushes and a dense groundcover of (delicious!) strawberries. There are also several flowers in there — two coreopsis that didn’t overwinter well, a big clump of gaura, one scabiosa, a single ‘Nana’ coreopsis (so cute!) and a couple hardy asters — two clumps of chives, a very happy oregano, and a MASSIVE parsley plant that’s about to bloom. Last summer, that patch of dirt also held a melon plant, several tomatoes (trained up a tomato cage near the house), and a clump of ‘Bright Lights’ chard. That clump of chard is what’s standing tall in front of the window now. I’m letting the plants flower, so I can save their seed. (Note to self: next time you decide to save seed from a chard plant, choose a plant that’s not smack in the front of the garden). To the right of the path is my herb hill: ‘Salem’ rosemary, garden sage (blooming) and purple sage, more oregano and more chives. 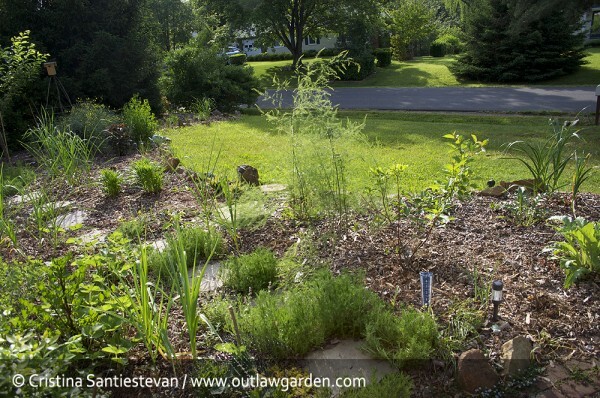 The hill helps with drainage — Virginia dirt is more clay that soil, and is notorious for slow drainage, which rosemary and other Mediterranean herbs despise. I also have some still-small lavender plants at the corner where the path meets the driveway, another blueberry and a clump of garlic. Closer to the house (not really visible here), I’ve got three artichokes and a few more clumps of garlic. You can see the street easily from here. This means, of course, the neighbors can easily see the garden from the street. I do my best to be sure they are looking at something nice. 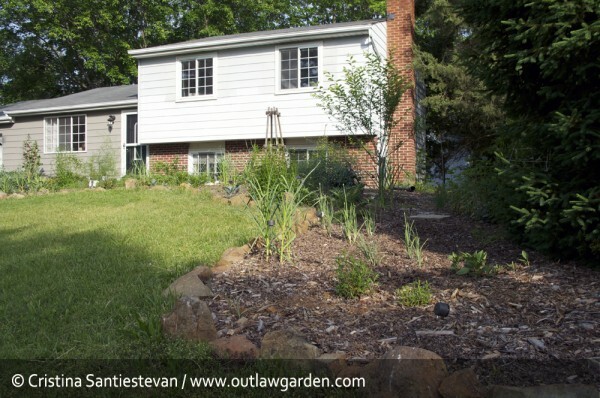 Because, I figure, an attractive garden is the best defense against getting in trouble with the HOA. To the right of the asparagus is the red-twig dogwood (winter interest!!). And, to the right of the red-twig dogwood, you’ll see the artichokes. These will also contribute to screening the house from the street. Hopefully. Assuming the artichokes continue to survive the winters here. This whole bed is fairly sparse now, because all the “anchor” plants are still young. Last summer, this patch of the garden also held some summer squash, bunches of basil and parsley, and some eggplants and peppers. 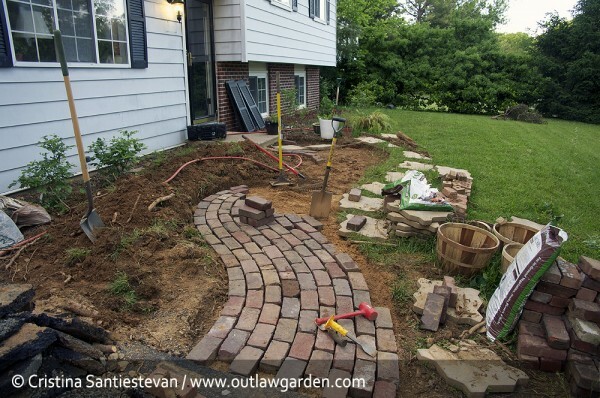 Here’s the stepping path through the bulk of the garden (do you recognize those pavers from the “before” photo?). To the left of the path, I have two more blueberries — one more ‘Northland Blue’ and an ‘Elliott’s’ — and three false indigos. In a few years, the blueberries and indigos should be large enough to form a respectable foundation planting. If you look down the length of the path, you’ll see the plum tree, which provides a nice bit of structure to the garden. This is where I grew most of my annual crops last year, and that will probably be the way I use this area going forward. There are some perennial wildflowers mixed in, and a couple more artichokes. But, for the most part, this section will die back to mulch in the fall, and spring up green and enthusiastic in the spring. For now. Unless (until?) I change my mind. Can you tell there are veggies in that garden? No? Well, good. My plan is working. Somewhere, I have a roughly-to-scale drawing of the garden layout. It dates back to last spring, so it’s probably not totally accurate. But, it’ll be interesting to see where my plans came through, and where they, ah, wandered. I’ll share that plan once I find it. And, at the same time, I’ll share my planned layout for 2012. In the meantime, I hope you enjoyed your tour! Since the garden is still a young garden — only one year old! — many of the plants that will eventually provide structure are still fairly small. I can’t wait to see how this looks in a few more years, when the blueberries are shrub-sized and the artichokes, asparagus and plum tree have added some bulk. Your garden is beautiful! I can’t imagine how anyone could ever have a problem with it!